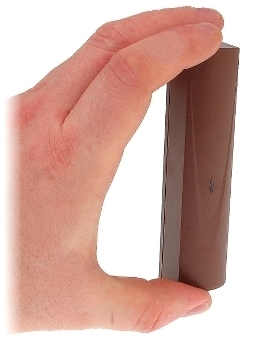 Wireless, magnetic doors or windows opening detector. The detector is "the first line of object protection", by which the alarm system responds to the intrusion even before the intruder will be able to get inside the protected area. It is perfect to create surveillance system in small-size buildings, such as e.g. : kiosks, summer houses, boutiques, freestanding garages and workshops, and wherever conducting wire installation is difficult or impossible to perform. Lithium battery to power the device ensures many years of work without having to replace it, so the system is as easy to get along in life as traditional wired solutions.